THERE is a reason they call the Christmas period the silly season. Every year emergency wards treat more patients over the Christmas break. Stress levels rise and more people over-indulge in alcohol. The number of patients involved in car accidents, domestic violence incidents and careless accidents all increase. 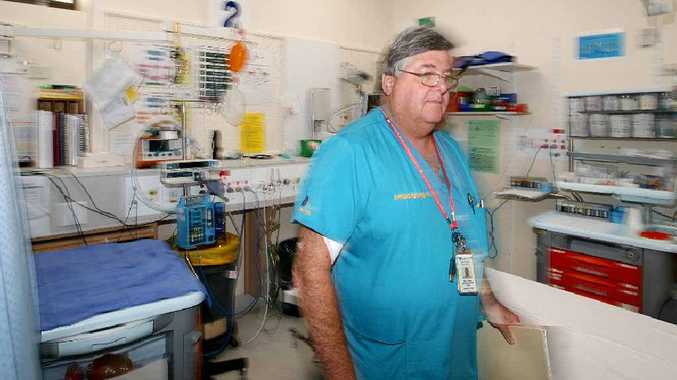 Mackay Base Hospital emergency doctor Neale Thornton will be on the front line this Christmas and he is calling for more people to donate blood. "When you have more accidents you need more blood," Dr Thornton said. "People are generally more stressed about money and the families will often get together and drink more than they normally would." Dr Thornton said as Mackay's population has risen there had been an increase of unnecessary accidents. "People seem to have more money, faster cars and are drinking more alcohol," he said. "There have been more accidents with people speeding in residential areas. "We had a chap come in who had been drinking the night before and had crashed on his way to work at 7 in the morning; he was way over the limit." The Australian Red Cross Blood Service is urging Mackay residents to book an appointment now and factor in blood donation, especially between December 24 and January 7, to ensure the region has enough stock to cope with the holiday season. The Blood Service is concerned that platelets, a component with a shelf life of just five days, will not be replenished after the holidays. "In the past Mackay residents have responded generously but with two long weekends in a row, we need them to be more generous than ever before to help us get through this period," the Blood Services' Pippa Peach said. It takes one hour of your time to give blood. For more information on donating blood call the Blood Service on 13 14 95 or visit their website at Donate Blood. Do you have a plan to avoid mishaps and injury over the Christmas period?